“Bodysnatchers” was released in 2007 on Radiohead’s In Rainbows album. The music of Steely Dan has come to Sierra Music! Originally arranged for the HR Big Band (Germany), the late, great Fred Sturm has given us another rock chart worthy of any band's library. 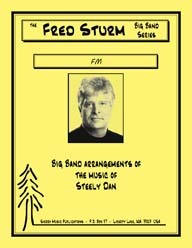 In typical Sturm fashion, the beginning of "FM" is a kaleidoscope of independent fragments culminating with the original Steely Dan intro as it moves into the melody played by clarinets. The music of Steely Dan has come to Sierra Music! The late, great Fred Sturm originally arranged this for the HR Big Band (Germany), and Sierra is thrilled to add it to its catalog. Set as a slow rock/gospel, there is beautiful, lush ensemble writing througout the piece. The music of Steely Dan has come to Sierra Music! From one of the masters of contemporary big band arranging, the late, great Fred Sturm completely captures the Steely Dan vibe in his arrangement of "The Goodbye Look." Originally arranged for the HR Big Band (Germany), Sturm gives the lead trombone (and section) Donald Fagan's voice of the melody. Composer Fred Sturm has written a wonderful and exciting shuffle tune which features tenor saxophone, trumpet and drums. As recorded on "Libertango ! 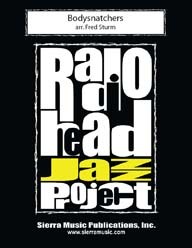 Hommage to Astor Piazzolla" by the HR Big Band (Germany), this arrangement will surely lift your audiences out of their seats. Astor Piazzolla's music lends itself well to the big band idiom, and Fred Sturm is a masterful arranger for big band. Astor Piazzolla's music lends itself well to the big band idiom, and Fred Sturm is a masterful arranger for big band. This new, original piece by the great Fred Sturm features drum set throughout in a modern swing tune that winds through many different feels. 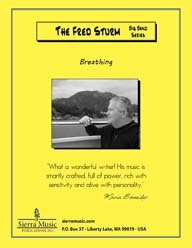 Based on a traditional Native American song, Fred Sturm has created a truly amazing masterpiece capturing the beauty of the melody with the intricacies and creativity of a big band.